Olympus M.Zuiko Digital Telephoto lens 45 mm f/1.8 Micro Four ThirdsThis single-focal-length portrait lens has a beautiful shallow depth of field which allows for background blurring effects that are not possible with the 14-42 mm kit zoom lens. The Movie-Still-Compatible (MSC) mechanism utilizes nearly "silent" focusing technology. It is great for tracking a moving child or pet, and provides a quick and silent focus mechanism for movies and still photography. 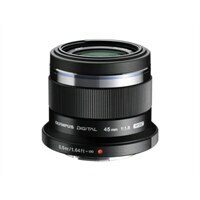 This single-focal-length portrait lens has a beautiful shallow depth of field which allows for background blurring effects that are not possible with the 14-42 mm kit zoom lens. The Movie-Still-Compatible (MSC) mechanism utilizes nearly "silent" focusing technology. It is great for tracking a moving child or pet, and provides a quick and silent focus mechanism for movies and still photography.